The long-delayed report about Rafi's haricut! 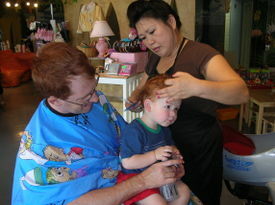 Last Sunday, our little boy faced his destiny at a local kids haircutting place called Snippets. I, of course, got suckered into getting the"First Cut Package" - which got me a cute little box to collect the clippings in as well as a video of the whole experience. Yes, yes, I'm a first-time parent and have "sucker" stamped on my forehead. Regardless, it was a pretty good experience. Rafi met Anastasia, his hair stylist, without a problem, but refused to sit in the little police car they offered him as a chair. Instead, he sat on Daddy's lap. Daddy got himself a little smock and we were off to the races. Rafi was hesitant at first, but he did great. No crying, no screaming, and once he saw Elmo on the TV, he even gave a little smile or two. Afterwards, all three of us headed off to buy Rafi some new shoes (including his now much-beloved pair of "Shabbat shoes") and to make a quick trip to the supermarket, which afforded me a quick opportunity to photograph the new 'do. Why Is There No Page in the Baby Book for "Baby's First X-Ray"? It's a rite of passage, right? Kid's first visit to the emergency room. Before anyone panics, Rafi is fine, or he will be. Basically, Brian sat down in an armchair yesterday at shul while holding Rafi and Rafi's left leg got caught between Brian and the chair. He calmed down pretty quick, so we thought it was no big deal. but when he got up from his nap, he wouldn't stand on the leg and screamed whenever Brian touched his leg. So off we went to the emergency room. A few x-rays, a couple of doctors, and one very fabulous sticker later, it seems to be some sort of bruise and some muscle pain. He's better today, we think, but he still won't put any weight on the leg. Through the whole thing he's been in very good spirits, so we're not too worried, but it'll be nice to (literally) have him up and around again. In other news, we have a whole bunch of new words and even some phrases. Rafi is doing well with transportation words, adding "guck" (truck) to buh and cah. He says cookie, help (which sounds remarkably like up, unfortunately), down, no more, hi daddy, thank you (we think), and cracker (I think I've mentioned gate and ball already). Fantastically, he says "waffle" - his favorite food, for the moment. Each morning, when I go to get him out of the crib, he looks at me and says "Daddy? Waffle?" And off we go to get our waffles. Best of all, I am now, officially, Mama. When he says Mama, he almost always means me. Finally! Not much else to report - Rafi's been enjoying the heat this weekend and tried out his little kiddie pool on the deck. We spent Father's Day with Bubbee and Poppa-Zayde today. Don't forget to scroll down to read about our fabulous weekend in NY for Maddy's first birthday! I Hate My Shoes! But Can I Wear Them All Day? Well, Rafi walks now, so real shoes are in order. We've been loving the Robeez - Rafi gets very excited when we pull them out of the drawer because they mean we're going somewhere. He knows what they are and that they go on his feet, and likes to "help" put them on. But walking means walking outside, and Robeez just won't protect little feet the way they need to. So Sunday it was off to Little Soles and we procured a new pair of Stride Rite Sandals. Why sandals, when it was 30 degrees in Chicago yesterday? Because it seems Rafi wears a size 5 extra wide, and thuse Little Soles had a pretty poor selection for him. We got the sandals so he'd have something to wear to school on Monday, and ordered the shoes online. So now I have a kid who wears sandals with socks. It's nice to know that he's still to young to care that he's stuck with his mother's horrid fashion sense. The visit to the store wasn't bad. Rafi certainly loved the toys and playing with the big kids. But he did NOT like having his feet measured, and didn't like the shoes at first. While he was curled up on my lap refusing to put his fet down and walk in his new shoes, the saleslady helpfully said, "this is great - most kids scream their heads off the first time they come in here." Rafi spent most of the day trying to pull the shoes off, then when we took them off him, he wanted to put them back on! He went through that for a day or so, and now seems to love them. This morning at school he was unwilling to have me put them away in his cubby and wanted to carry them around while he played. So I think the shoes will be a success. The sneakers have arrived in the mail, so we'll see how those go over. In other news, we celebrated Sam and Shuli's wedding this weekend, and Rafi got to spend time with his pseudo-cousins and the rest of the pseudofamily. He got many hugs and kisses, and managed to get his considerable bulk carried around by his very lightweight older female pseudocousins. A good time was had by all. 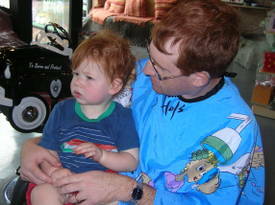 Finally, Rafi had his 15-month appointment with Dr. Goldstein yesterday. He's healthy and adorable, weighed in at 24 lbs 4 oz. (less than last week - go figure), 32 inches long. He screamed his head off on the scale but oddly enough had little problem with the shot and the blood draw (for lead testing). In all, a pretty painless morning at the doc's office. More updates soon - including photos from the upcoming visit of Sawyer! And, oh yeah, her parents. Yes, ladies and gentlemen, we have both walking and talking. We are woefully deficient in updating the blog, but honestly, the walking and talking just started this weekend. First, the walking. Starting on Saturday, we noticed a change in the usual pattern. For ages now, Rafi has been able to take a few toddling steps, but only does so when urged to - crawling is still much faster and more accurate. Usually, he'll move between objects by reaching out for the one he's trying to go to, then cruising over to it, or dropping to the floor, crawling, then pulling up on the new object (which for the last month or so can be a wall). He can stand up without holding onto something, and has been more stable standing around for a few weeks now, but this hasn't translated to walking. But starting this Saturday, he started walking between objects without crawling, and is now, of his own volition, walking 10-15 steps with no problem. Often he'll take a little break to hold onto something and steady himself before moving on, and he still prefers to be carried, but in the baby book, I'm declaring walking to have taken hold just before the fifteen month mark (which is today). Talking is progressing nicely. "Buh-bye" is still the word of choice, but since this weekend we have developed several words. He says "buh-buh" for bubbles (during the Pesach cleaning we unearthed a bottle of bubbles and he LOVED them and has been asking for them ever since), and now says "eeeeeeze" for both cheese and please. We can tell the difference both by timing and context, and because please is usually accompanied by the sign for please, while cheese is usually accompanied by frenzied pointing toward the kitchen and/or the sign for more or the sign for food. Rafi has also learned at school to say "amen" after blessings, and regularly says it whenever he hears a bracha. Interestingly enough, he's also getting good at people's names. Rafi seems to know and use the names of many of the kids in his class - when Aaron (Ah-ra) and Orri (oh-ee) arrived at school today, he called them both by name. He sometimes calls Elan "eeeeee," and I've also heard him say Hazel (aaaaay). I've been told he calls his teacher Jen by her name as well, but have not yet witnessed it. "Mommy" and "Daddy," however, are nowhere in sight. He babbles mamamama a lot, but it doesn't mean me yet. Sigh. The combination of sign, verbalization and movement is making it much easier to know what he wants. For example, when he's ready to go to bed at night, he'll often make the sign for milk, then the sign for sleep, and either point to his crib, or go over to his crib and pat the bars or reach in for his bear and pacifier. Today at school, when he arrived his friend Elan was coloring with crayons on a piece of paper taped to the table. Rafi immediately walked over to the table, touched the box of crayons, pointed several times at the table and then sat down in the chair across from Elan, continuing to point at the crayons and the table. Clear as day, and now both Bubbe and Grandma will be receiving their first pieces of artwork from Rafi! Chag kasher v'same'ach to everyone. A joyous and meaningful Passover or Easter to all those we know who celebrate. Rafi took two steps! Yesterday we were hanging out in the third bedroom watching the Olympics, trying to give Rafi a change of pace from his bedroom. Rafi was a in a good mood and standing a lot, so Brian turned him towards me, about 3 steps away, and said "Walk to Mommy!" and he did! Two whole steps all by himself. I'm sure we won't see any more walking for a while, but for now, this was fun. Rafi now gives hugs upon request. It's pretty fabulous. He seems to be starting to understand basic commands and requests, although it may be partially coincidence. Today I asked him to bring me his shoe, and he did. Listening to our requests on the changing table, of course, is a whole different matter. Meal time is becoming a challenge. Food Rafi used to love now seem to be uninteresting to him. No more mac and cheese, no more peas. We're trying a number of other things (baked potato and chicken sausage are both current hits) and he continues to eat a ton at school, so we're not concerned. Not much else to report, so here's a good bathtime photo. 13 month photo available in the Growth Chart. Rafi spent a wonderful birthday weekend with family and friends. Because this was Rafi's party (and thankfully, he didn't seem to want to cry) we did him the huge favor of getting him a large balloon to bat around. Regular readers of this blog will remember the joy Rafi finds in helium-filled mylar. as you can see, the big "1" balloon was a smashing success, and he's spent quite a while playing with it since. In the photo is, of course, Aunt Susan, who came out from New York with Grandma for Rafi's birthday. We were also thrilled to have Aunt Mindy, Uncle Neni and cousin Maddy come out to visit. Rafi seems to have very much enjoyed his party. I am pleased to report, as you can see, that Rafi even wore his party hat for a brief time while enjoying his very first cake, first chocolate, and first icing. Rafi had eaten a big lunch and didn't have much of an appetite for cake, but this didn't stop him from smushing a bit on his nose so Mommy coulod get the photo she wanted to put in his rehearsal dinner video. A good time was had by all. Today we had a playdate with the lovely and talented Charlotte, daughter of Todd and Tara. Charlotte is about 3 weeks older than Rafi, and was able to show him some cool tricks, like excellent furniture-cruising. The two kids shared a nice lunch, played together wonderfully, participated in some good sharing, and generally avoided pulling each other's hair. The adults had a good time as well, and similarly avoided hair-pulling. Todd has a significantly better camera than I do, so I hope he got a better photo I can replace this one with. Happy birthday to Rafi! Nothing more to report, but thought we should mark the day in this space. When this kid develops, he develops. He's only been crawling for a short while, and as of last night, he now pulls up. I got home from work on the last side last night and Brian was doing laundry. Rafi was doing one of his favorite things, which is hanging out in the laundry basket. 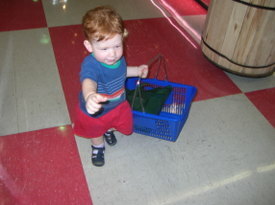 He saw me, grabbed the edge of the basket, and pulled up to standing like he'd been doing it forever. He did it once more before bed, then pulled himself up in the crib, too. And thus we must babyproof a whole new set of stuff. When I dropped him off at school this morning I asked if he'd done it there, and they said no, so by some miracle we've managed to both be there when he first crawled and first pulled up. This did lead to an amusing conversation at school where they asked me if we wanted them to tell us about things he does there - apparently, some parents don't want to know if their kid takes his first steps away from them. I assured them we were fine knowing. Ladies and gentleman, we have crawling! After weeks of rocking back and forth on his hands and knees, getting around by flipping onto and off of his tummy, and sitting himself up, Rafi is now a crawler. We were sitting on the floor at shul for Shemini Atzeret and I put a toy out of reach, as I've done a million times. This time, Rafi turned himself onto his hands and knees and crawled over to it, as if he'd been doing it forever. He repeated the feat several times over the course of the day, and today he's been zooming all over the place. Needless to say, we'd better get moving on that baby proofing.